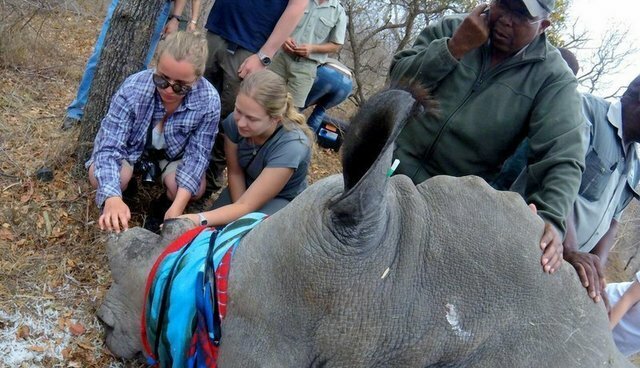 We came rushing in; each person carried something pivotal to the procedure, everyone having a part to play in the de-horning of this massive, majestic rhino. She lay in the brush (as rarely do they collapse into more convenient, open areas), immobile, helpless. The sedative taking effect. Before the vet could even start directing the all too familiar procedure, the chainsaw roared to life, immediately going to work to clear away the thorny bushes and branches around her. Time was crucial, as leaving an animal under anesthetic or in the same position for too long, could be damaging. Once space was made, a team of no less than six men rolled her into place. The chainsaw still in hand, the work began. As the horn was sawed away, a little at a time, the minutes became more surreal. What an amazing moment: to be so close and feel her breath under her warm enormous body, against me. Horn shortened, she was again re-positioned, keeping pressure off her fragile legs, so as not to crush them under her massive weight. Dr. Rogers began carefully sanding down the edges, rounding off the stub. Shielding our eyes, particles and dust from the horn flew in all directions. It rained down into my hair, on my face, across my arms and chest. Picking a piece up, no different from my own fingernail shavings; I marveled at the fact that this is why she's in danger. This is why they are all under peril. Someone jokingly remarked "you have gold in your hair." The reality of it weighed heavy in the air. One of the team was in tears, others just silently watched the doctor meticulously work. As he finished the process, one of the team took blood to test, another applied the antiseptic to the minor scrapes and cuts she sustained from falling from the darting process. Finally she was given the anesthetic reversal, the blanket pulled from her eyes and we moved out. None the worse for wear, she stood, hesitated for the briefest of moments and ambled off back into the bush, her companion waiting not far off. 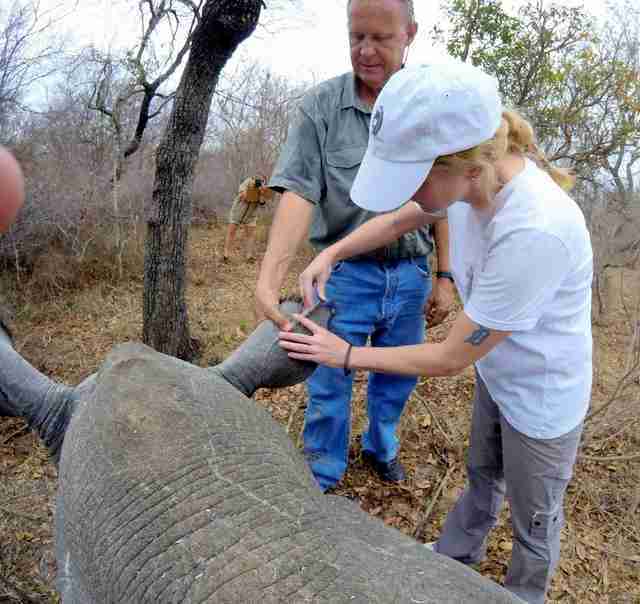 In our recent visit, we had the privilege of working with Dr. Peter Rogers and the team on de-horning one of the former victims of poaching at the Hoedspruit Endangered Species Center. 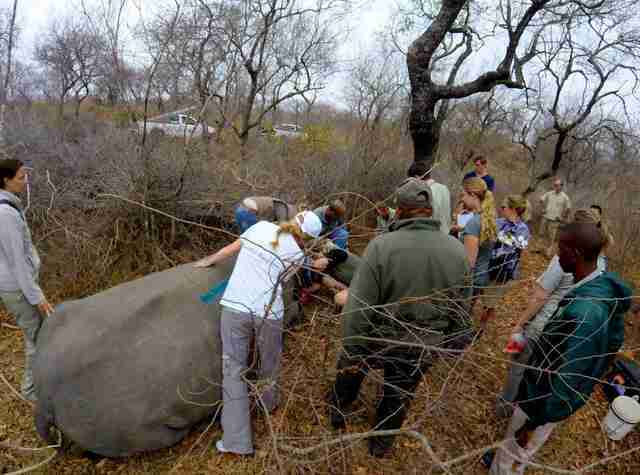 In August of 2013, Dingle Dell and Lion's Den, two rhino cows were poached. 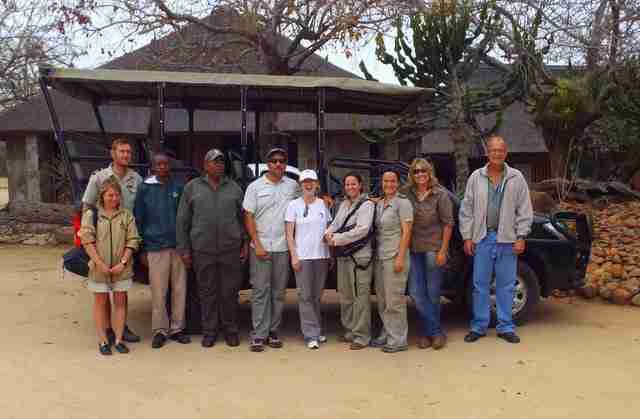 Fortunately with the help of Dr. Rogers, Dr. Johan Marais and their stellar veterinary team, they survived. The two have endured countless procedures since then, and recently underwent another dehorning to make them less of a target to would-be poachers. 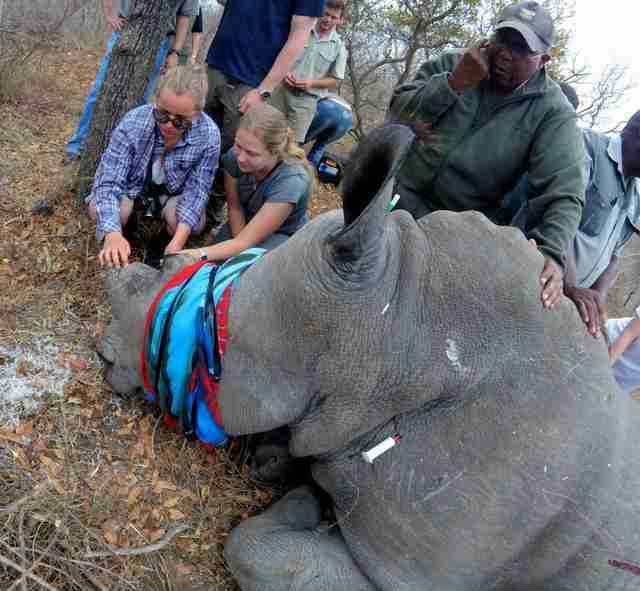 De-horning is now a common procedure for a great deal of the remaining rhinos in South Africa. Yet no matter how much the "norm" it has become, there are moments when it hits you: the irony that we must rob a creature of its parts in order to save it from others who seek to do the same - just to save its life. We thank Dr. Rogers, his team and the staff at HESC for their professionalism, dedication and hospitality. It was an honor to fund the cows' procedures as they continue their rehabilitation at the center.